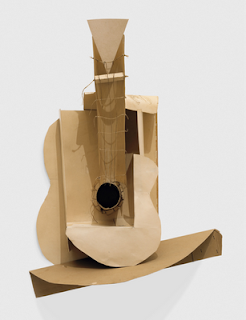 Picasso’s first Guitar construction was a sculpture made between October and December 1912. Cobbled together from cardboard, paper, string, and wire—materials he cut, folded, threaded, and glued—Picasso’s silent instrument resembled no sculpture that had ever been seen before. Its creation coincided with Picasso’s embrace of a wide range of what were then unconventional materials, including cardboard, newspaper, wallpaper, sheet music, and sand. 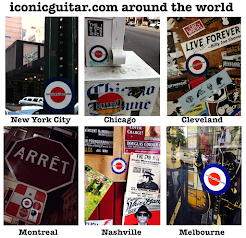 In 1914 the artist reiterated his fragile, papery Guitar construction in more fixed and durable sheet-metal form. In the early 1970s Picasso donated both works to The Museum of Modern Art.